All wallpaper patterns come in matching fabric. The manufacturer has changed the fabric. Although beautiful (we use it to make our pillows), it is no longer a perfect match to the wallpaper. $15 for one sheet of 8 X 10 inch (You actually receive 8 X 10 1/2 inch sheet, 1/2 inch bottom portion is selvage. We opted not to trim this portion so you can use it as a seam allowance. The default scale is one inch. The fabric is 100% cotton, 200 thread count, soft to the touch and is ready to use. The print is permanent. For best results do not wash.
You can steam the fabric. Avoid getting the fabric wet. To set pleats, lightly mist the fabric with spray sealer. Allow to dry. Repeat. Avoid saturating product. Test on scrap piece first. As fabrics are printed to order. 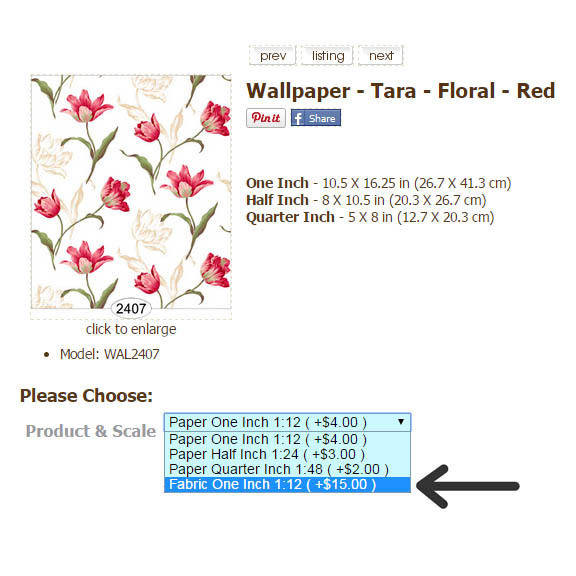 Fabrics are considered a custom item. No returns, refunds or exchanges on fabric purchases. All fabric sales are final. Please feel free to contact us at 347-524-9569 should you have questions.